We’ve been in our home just over two years and I still love it. It felt like home straight away even though it was a blank canvas. We’re slowly decorating each room and putting our own style to them. We have a family bathroom that the girls use and it is just a white room. 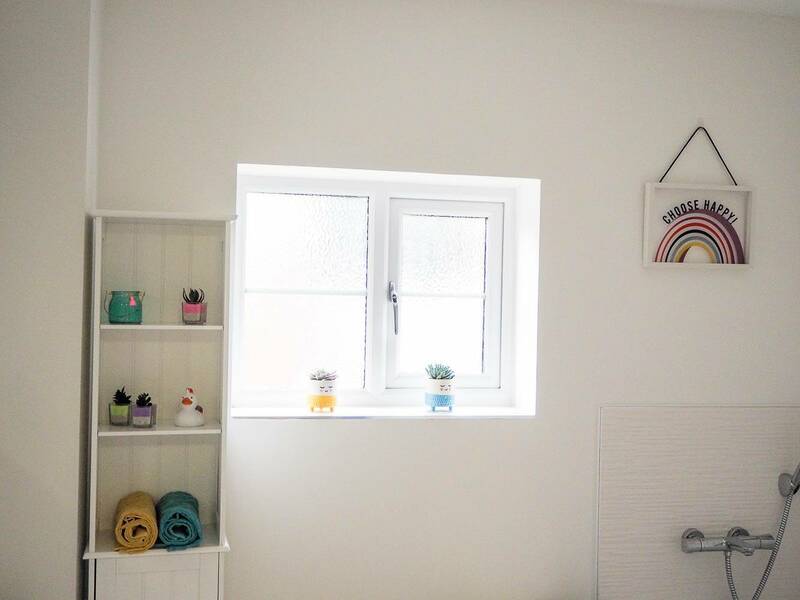 All I’ve done is put a laundry basket in and a toilet roll holder and apart from that we’ve just been putting bottles and all sorts on the window sill. There is no storage in the bathroom and even though the room is quite a nice size, there is not a lot of options on where to put a storage unit. When VonHaus got in touch to ask if I wanted to style my bathroom, I jumped at the chance. It has been on my to do list to get this room done, but it got bumped to the top of the list. When I looked at the range of bathroom furniture they had available, it was great to see that there were options no matter what size your bathroom was. I choose the Tall Bathroom Storage Unit, as I thought it was better to take advantage of the height and still have good storage options. When I measured up for it, there was a couple of options that I could put it and decided to wait until it arrived to decide where it looked best. What I love about styling a room is getting all the accessories that can really transform a room. As I said before our bathroom was just white, with nothing on the walls and no accessories. I couldn’t wait for the unit to arrive. As soon as it was in the bathroom I knew instantly where it should go. What I loved about the unit is that it is split, the bottom half is a cupboard where I can store all the bottles of shampoo, cotton wool, sun cream etc It’s all out of sight and instantly the bathroom felt tidier. Whilst the top half is shelves, where you can add some accessories and add style to the room. What I also like about the unit is the paneling on the door and also at the back of the shelving unit, at the top. The added detail really makes a difference to the look of the unit. When it came to styling, the shelves gave me a place to put the towels that weren’t being used and using the towels as part of the style of the room, is a double win. Because it’s the girls bathroom, I wanted to add lots of bright colours to it and show their personalities. On the windowsill I added some fake plants, I went for fake ones as it can be difficult to keep plants alive in a bathroom. I loved these ones when I saw them, with their smiley faces you can help but smile back. 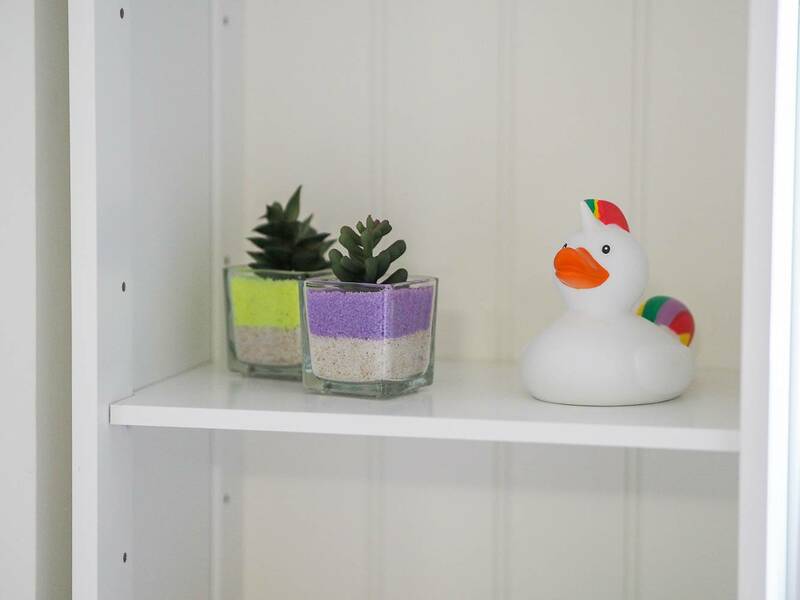 Holly’s favourite thing is rainbows, so much that she has a rainbow themed bedroom. 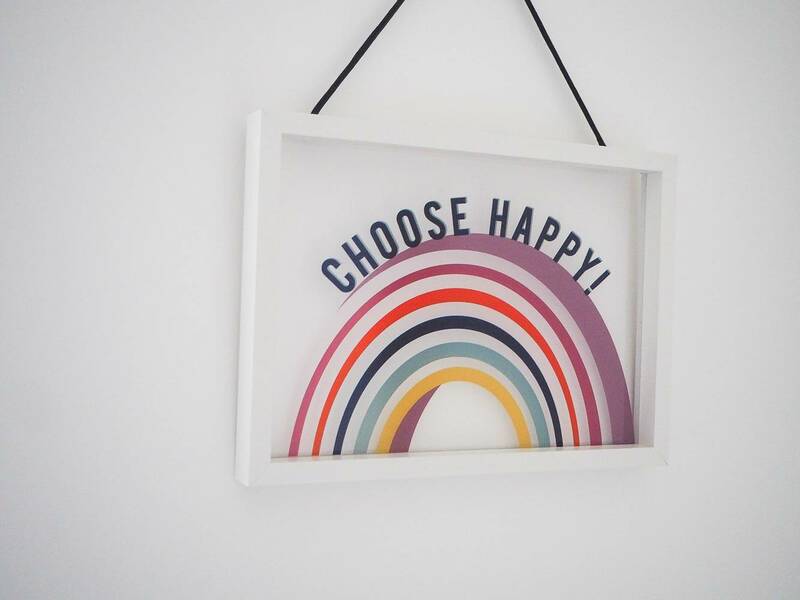 When I saw this photo frame, I initially thought it would look good it her room. But to be honest, she has enough in there already and actually I decided it was perfect to add some colour to this wall. 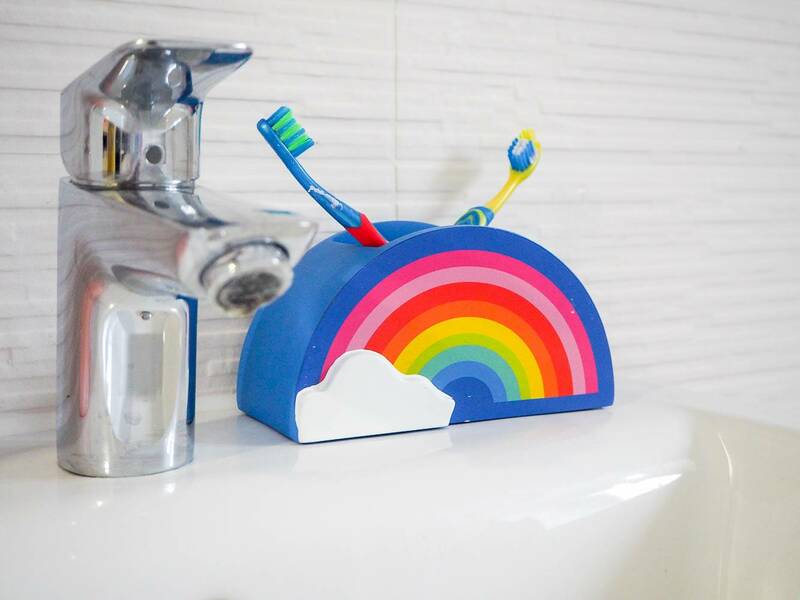 Carrying on with the rainbow theme, I couldn’t resist this toothbrush holder. The girls screamed with delight when they saw it. It has definitely made them more excited to brush their teeth. 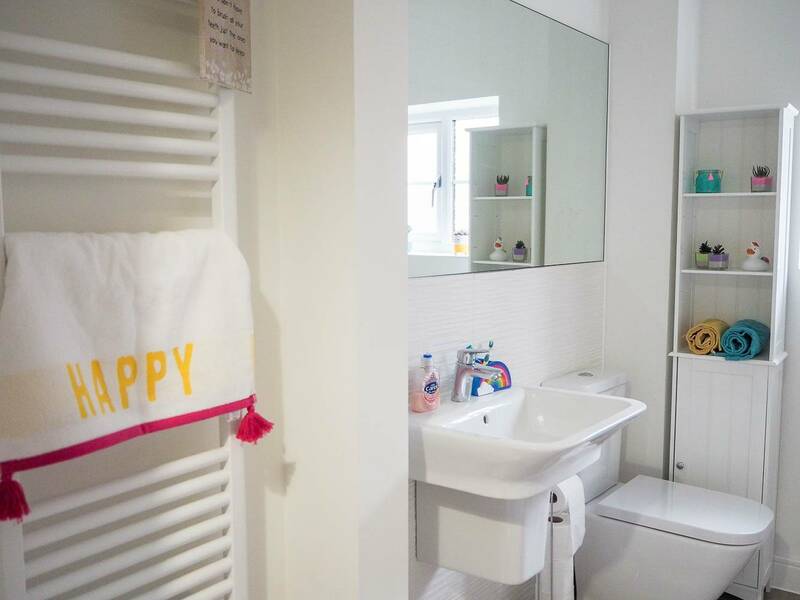 One of my favourite items in the room, is this happy towel. 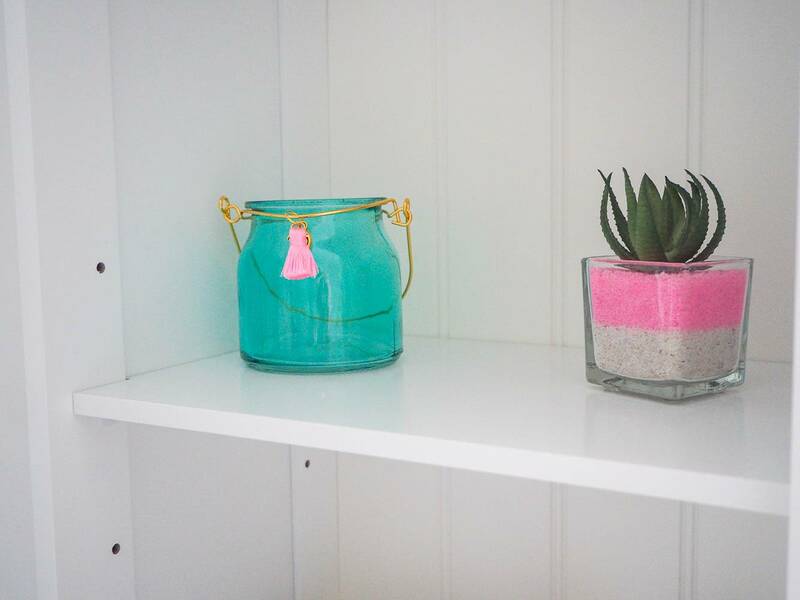 It compliments the happy photo frame perfectly and I love the tassels on it. I’m really happy with how the bathroom now looks. It has made a big difference to this room and it now feels like people actually live here, if you know what I mean. 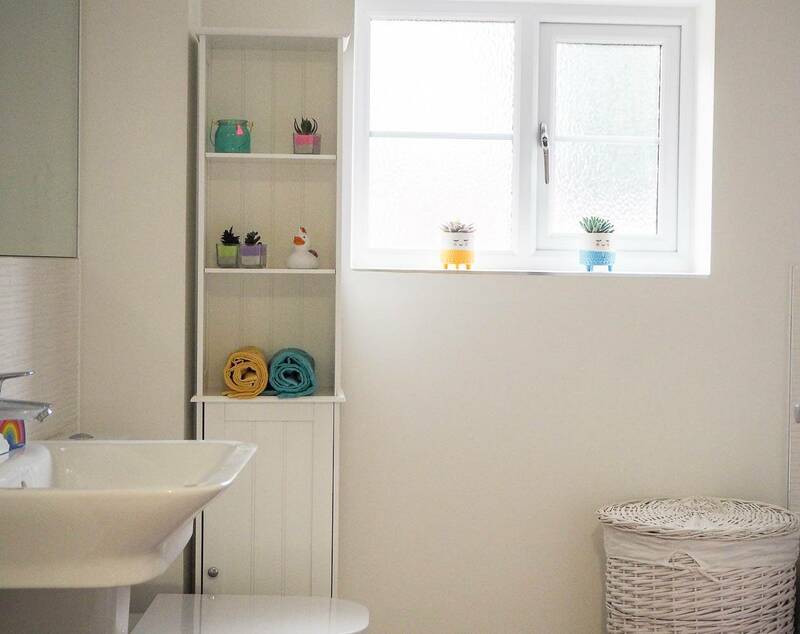 When I now walk past the bathroom, I feel my eyes drawn to look in because I love it so much and I can’t believe what a difference having the storage unit has made to not only the look of the room, but to have somewhere to store everything. Disclosure: We were kindly sent our bathroom unit for the purpose of this post. All views, opinions and photos are my own. 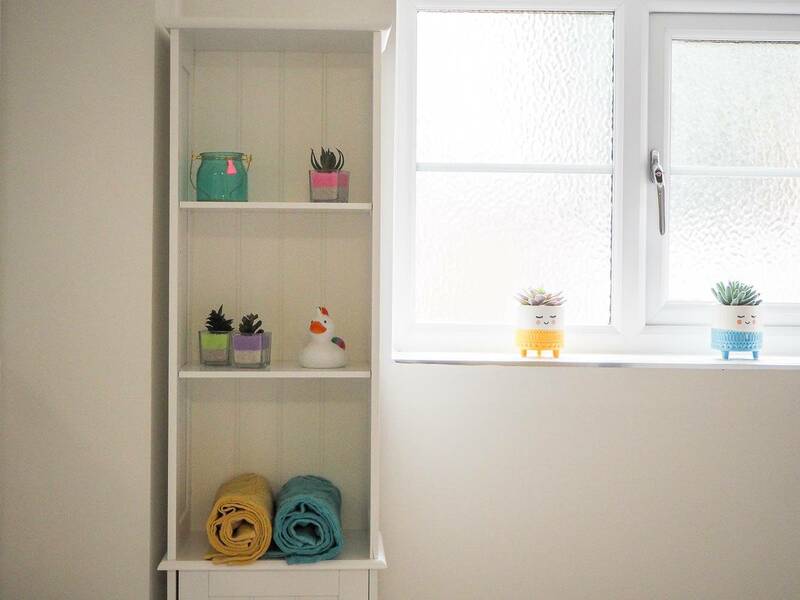 Oo I love the bathroom unit – so convenient and the perfect fit for that space in your bathroom 🙂 Also, fake plants are definitely a winner – I also somehow manage to kill plants far too easily! I love all the little pops of colour you’ve added! 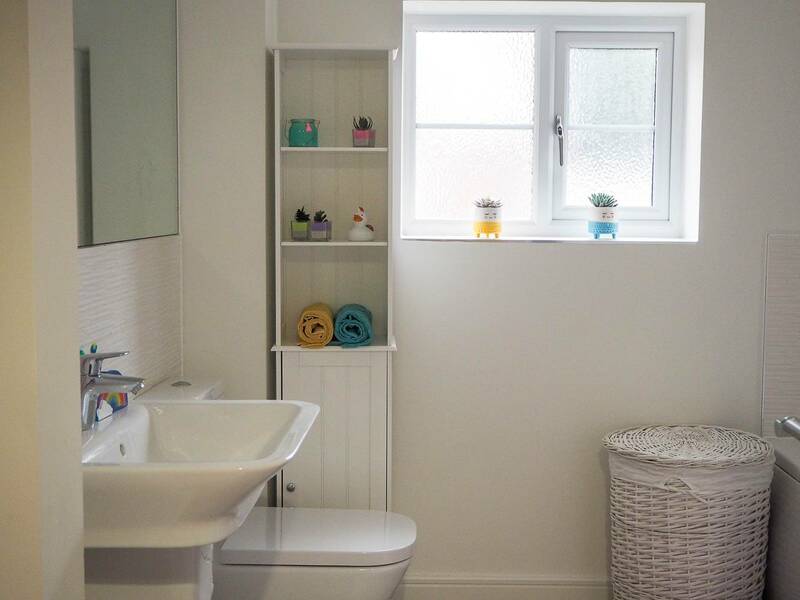 Sadly, our bathrooms are all currently very beige and dull, but yours is so light and airy it looks great! It’s beautiful I could definitely do with some of this style in my bathroom. Love what you’ve done here. It’s really given me some ideas on how to improve my bathroom! 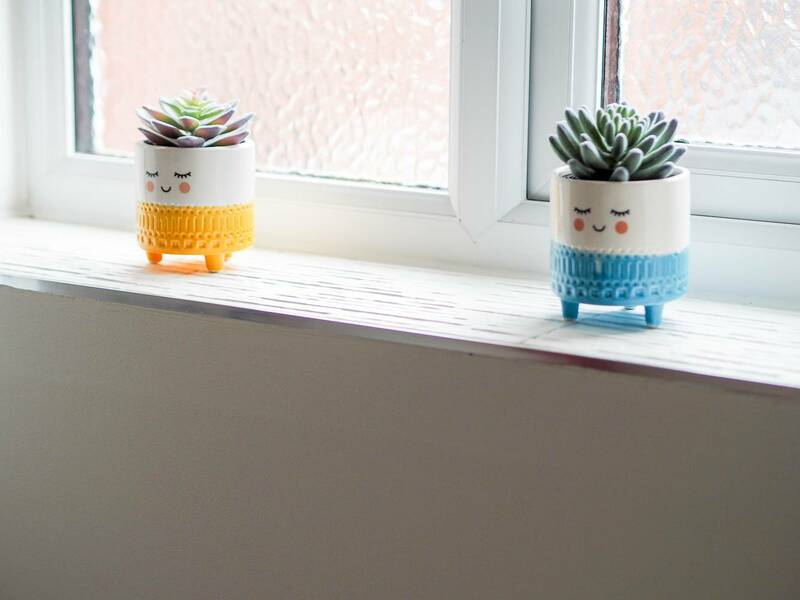 I love those little plant pots with faces on!! 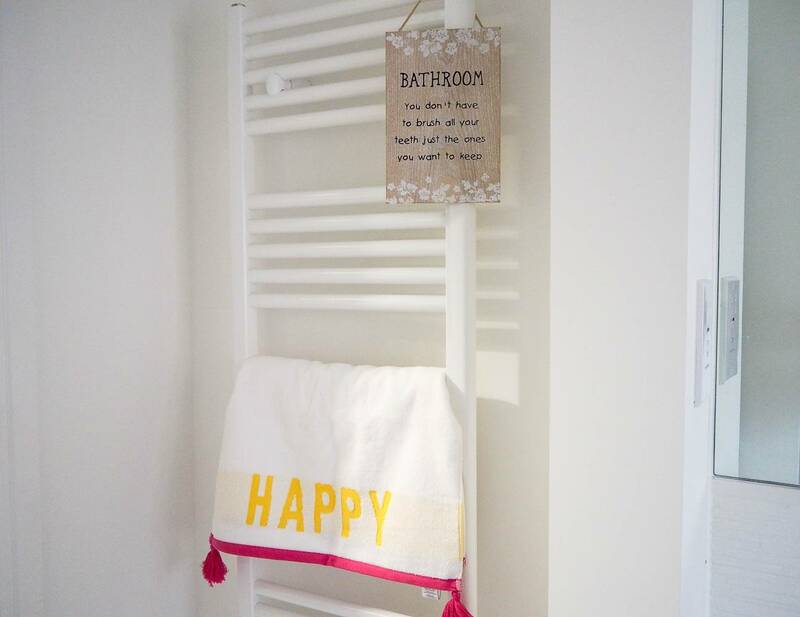 We have a plain white, slightly unloved, family bathroom – this has given me some ideas how I can liven it up a bit. The bathroom unit sure makes a big difference. I like how it’s compact yet had space for display items too. Also that happy towel is brilliant. Oh that couldn’t fit any more perfectly! I love the unit, it makes a big difference to the bathroom! That unit is amazing and im loving all the pops of colour! I love the bathroom unit. You have styled your bathroom great.